Virtual reality (VR) art projects have a distribution problem: how do you reach a broad audience when the immersive art, designed to be experienced one person at a time, requires the use of a pricey headset and the help of a gallery guard tugging your clothes or equipment so you don’t walk straight into a wall? Nancy Baker Cahill, a Los Angeles artist who recently “exhibited” her new set of four “virtual reality drawings” at LACE (Los Angeles Contemporary Exhibitions), has a partial answer: augmented reality (AR). Her virtual works feel like her shrapnel-like graphite drawings come to life, letting you walk into the hailstorm of brushstrokes or stand more contemplatively in the eye of the storm, while her AR app 4th Wall, which you can download for free on an iPhone, gives you the power to place one of her dimensional drawings anywhere in your camera’s field of vision and then navigate through the space. The best examples so far, posted on 4thwallapp on Instagram, have a darkly surreal flair. 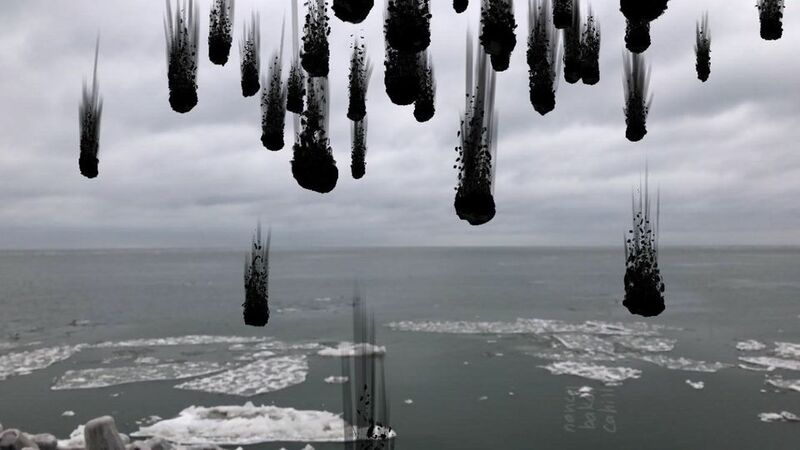 One user set a black flock of brushmarks in a cloudy sky over the Caribbean. Another dropped a bomb-like drawing in the Chambers Street subway station in New York. Another yet set an exploded volume on an airport baggage carousel, where it sped along like unclaimed luggage. Baker Cahill says it’s the first time she has used AR to “place art ephemerally and digitally in the public domain,” creating a kind of public art that invites collaboration.